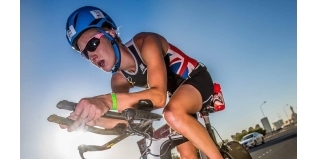 While she may well be the two-time and reigning ITU Duathlon World Champion, it's not an unreasonable statement to say that Great Britain's Emma Pallant cames close what may well have been the biggest win of her career to date on Saturday, when finishing a close second at Ironman 70.3 Bahrain, the Middle East Championship. One of the leading five athletes that reached T2 within a minute of each other (along with Caroline Steffen (SUI), Diana Riesler (GER), Sarah Crowley (AUS) and Tine Deckers (BEL), at 15km into the run Pallant was in front on the half marathon, holding a narrow lead over the Aussie, Crowley. She couldn't quite hold it to the finish line at the Bahrain International Circuit with the race best 1:20:40 run from Crowley (Pallant clocked 1:22:21), bringing the Australian home first with a winning margin of 1:26. Nonetheless, the British athlete earned $10,000 of the total $100,000 championship prize purse in what has been a busy period of late-season racing. Now really starting to find her feet at this format and distance of racing, she really does appear to have what it takes to be a contender at the top rank of racing in this format around the world. As you may have already read (see her race report on the link above), Alice Hector was a strong seventh, with fellow brits Natalie Seymour and Caroline Livesey (both pictured below), 12th and 13th respectively. Six days ago New Zealand's Terenzo Bozzone produced his bes ever performance over the Ironman distance when winning Ironman Western Australia in course record time, to join the elite Sub-8 Club. Tired from that? Well, it didn't show. Speaking to Bahrain Endurance 13 Media, Bozzone commented. "I won Ironman Western Australia last weekend and felt my body starting to come back the last few days. This was really cool. I haven’t been able to stand on the start line here in Bahrain but was able to make it happen this year." Make it happen he did, the men's race can basically be explained by his bike split - 1:56:48 - versus a host of 2:01 / 2:02's from his nearest rivals. While he was closed down on the run, his 1:15:16 half marathon was still enough to hold off the 1:11:25 of Germany's long-time ITU athlete, Steffen Justus.